Rama IX served as a revered symbol and also shielded his country from the worst consequences of its political instability. What makes an ideal king in the Buddhist tradition? This is a question that many will ponder, as Thailand mourns the death of the late Rama IX (Bhumibol Adulyadej) and awaits the ascension of his controversial heir, Maha Vajiralongkorn. Buddhist monarchs continue to reign in Thailand, Cambodia, and Bhutan (and Buddhism has influenced the more Shinto-oriented imperial tradition of the Japanese monarchy). Moreover, the metaphysics of Buddhism remain intertwined with office of the Dalai Lama. The Buddhist tradition of kingship has a long history. Royal patronage of Buddhism goes back to ancient South Asia, when several ancient kings patronized Buddhist monks and the Buddha himself came from a royal family. However, the key moment in Buddhist history was the conversion of the Indian Emperor Ashoka of the Mauryan Dynasty to Buddhism around 260 BCE. Ashoka’s conversion was the result of the remorse he felt after his brutal conquest of Kalinga (modern Odisha). He helped promote Buddhism by setting up rock edicts throughout his empire and by sending emissaries to other kings, including the Greek dynasties that had carved up Alexander the Great’s empire. Ashoka remained the model for early Buddhist ideals of kingship, which held that the ideal king was a chakravartin, an ideal ruler who rules benevolently throughout the world through dharma (righteousness). A chakravartin keeps the wheel (chakra) of dharma going, in other words, by laying down righteous laws and teaching his people to live in accordance with the teachings of Buddhism. Chakras appear on the Indian flag and the emblem of the royal dynasty of Thailand. In the tradition of Ashoka, Buddhist kings were supposed to use their power primarily in defense of dharma. From the beginning, however, there was a tension between the realities of politics and military necessities and the ideals of Buddhist kingship. This can be seen through the very life of Ashoka himself. Even though he is portrayed as an ideal ruler, he is also portrayed as “fierce,” and therefore as an “armed chakravartin.” It was this tension that led to the replacement or overshadowing Buddhist ideas of kingship and governance everywhere the religion spread. In India, Buddhism was reabsorbed into Hinduism and the ruling and warrior classes maintained a ruling ideology based on the grant of power from the Hindu gods Vishnu and Shiva, necessary to prevent the primeval chaos of an ungoverned society. In Japan, Shintoism eventually prevailed as the ideology of the imperial family, transforming into the militarized State Shinto after the Meiji Restoration (1868). In China, by the time of the Song Dynasty (960-1279 CE), and in Korea during the Choson Dynasty (1390-1910 CE), neo-Confucianism pushed Buddhism out of its role in governance. 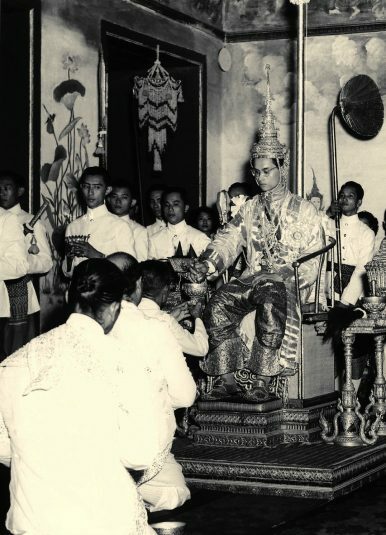 In regions such as Southeast Asia, however, which remained Buddhist, the original ideals of kingship remained important in the theory of kingship. But even these were diluted. Hindu views of what a king ought to do and his sources of power prevailed in countries like Thailand and Cambodia. The king was seen as a divine incarnation of Vishnu, and in particular modeled after the avatar Rama. His rule was not only for the purpose of establishing dharma but law and order; his consecration and crowing involved Hindu rituals, Vedic chants, and martial symbolism from Hindu deities. The idea that the king ought to be more than a paragon of virtue, but a competent military and political operator is at once dangerous and beneficial in modern times. By remaining a symbol of dharma and not getting overly involved in the nitty-gritty of law and order, a king can maintain the prestige of his dynasty. But by also helping maintain order and some semblance of stability in an increasingly fractured and politically chaotic country, like Thailand, a king can also draw from the Hinduized elements of Buddhist kingship that emphasize law, order, and punishment. Rama IX was able to both serve as a revered symbol and shield his country from the worst consequences of its political instability. It remains to be seen if his heir can do likewise. Will Thai citizens tolerate the Junta's rule without their beloved king?